Below is a list of some of the folks who have positively impacted me in my career as a strength and conditioning coach. Some of these people are friends of mine. Some I have been lucky enough to meet and spend time with, while others have led by example through their tireless efforts to promote safe, productive strength and conditioning practices. Not only have they positively impacted my own development, but their work has inspired and positively influenced numerous coaches within the industry, and countless athletes around the world. This list is presented in no particular order (it's not a top ten). Mark Asanovich has years of NFL Strength and Conditioning experience. Including time with the Minnesota Vikings, the Tampa Bay Buccaneers, and the Jacksonville Jaguars strength and conditioning programs. His program emphasizes individual supervision of player workouts. It is his belief that players who are coached in the weight room will develop better results. The cornerstone of the program is to “maximize physical potential and minimize physical injury.” Asanovich has been a speaker for consecutive years at the Strong-S seminar in Tokyo that is organized by the renowned Japanese trainer Tatsuya Okawa. Matt Brzycki has authored, co-authored and edited seventeen books. In addition, he has authored more than 435 articles/columns on strength and fitness that have appeared in 44 different publications. Matt has given presentations throughout the United States and Canada. He has also given presentations to the Central Intelligence Agency; US Customs and Border Protection; and US Secret Service Academy. He was appointed by the governor to serve on the New Jersey Council on Physical Fitness and Sports as well as the New Jersey Obesity Prevention Task Force. Dr. Ellington Darden is the leading disciple of the H.I.T. training method. Darden, for 17 years the director of research for Nautilus Sports/Medical Industries, is the author of such enormously popular books on high-intensity workouts as The Nautilus Book, High-Intensity Bodybuilding, and 100 High-Intensity Ways to Build Your Body, along with over 40 other fitness books. Patty Durell has been helping people achieve their fitness goals for over 24 years. She is a Master Level Personal Trainer, Certified Conditioning Specialist, licensed Physical Therapist Assistant, and CEO of Rock Solid Fitness, an exclusive personal training studio in Dunedin, FL. She is also a member of Business Networking International, on the Board of Directors with the Chamber of Commerce in Dunedin, FL, and on the Advisory Board for the Palm Harbor University High School Medical Magnet program in Palm Harbor FL. Jim Flangan met Henry “Milo” Steinborn, world’s strongest man at the time and champion wrestler, and began strength training under Milo’s guidance. He continued training with Milo for years to come and along the way met Arthur Jones, inventor of Nautilus and known worldwide as the man who changed the face of fitness forever. Arthur was a fitness genius and true living legend. Jim purchased a full line of Nautilus equipment from Arthur in 1973 and proceeded to open Orlando, Florida’s first fitness center, Jim Flanagan’s Nautilus Fitness Center. Mike Gittleson spent thirty seasons as the Head Strength and Conditioning Coach for the University of Michigan’s football program. He was appointed the athletic department’s first strength and conditioning coach in 1978. Gittleson was recognized by the Professional Football Strength and Conditioning Coaches Society as the 2003 National Collegiate Football Strength and Conditioning Coach of the Year. Gittleson maintained the overall training and conditioning of the football program in one of the finest facilities in the country. 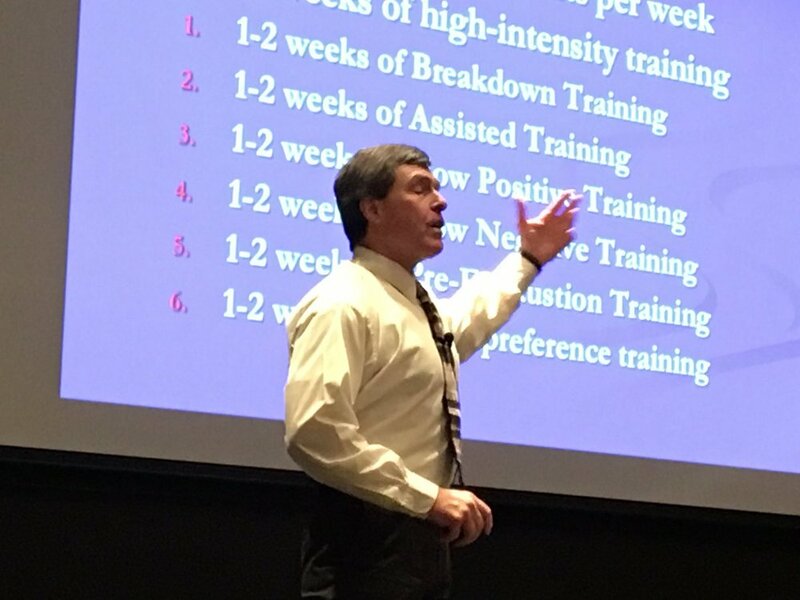 He developed a unique and scientific approach to Michigan’s conditioning program, tailoring each program to the individual player in order to provide the maximum physical output and the prevention of injuries. Dr. Ted Lambrinides is currently a strength and conditioning coach for the University of Kentucky. Ted did his undergraduate studies in business marketing and graduate studies in coaching and exercise science at The Ohio State University, where he began his career as a student assistant and graduate assistant strength and conditioning coach. After OSU, Lambrinides worked as director of education for two fitness companies, Nautilus Midwest and Hammer Strength Corporation. Dr. Ken Leistner, for decades a concerned voice in the powerlifting community as a competitor, trainer, judge, national athletes’ representative, and administrator, was the Feature Editor, monthly columnist, and the author of articles ranging from training advice to political commentary for POWERLIFTING USA Magazine. With over 1000 published articles in the area of strength enhancement and injury prevention and rehabilitation, Dr. Ken was asked to edit or rewrite the rulebook for two of Powerlifting’s major federations. Dr. Ken has served as a consultant to numerous university athletic programs and NFL coaching staffs. While many in the sport know Leistner through the Steel Tip Newsletter of the 1980’s, many articles, and former ownership of the National and World Championship winning Iron Island Gym, Dr. Ken is as well known for his contributions to the Chiropractic treatment protocols first used at the U.S. Olympic Training Center and the design and prototyping of Nautilus and Hammer Strength equipment dating back to the early-1970’s. Ken Mannie has spent 24 years as Michigan State’s head strength and conditioning coach for football, while additionally directing and overseeing the strength and conditioning programs for all men’s and women’s sports. Mannie has been a keynote speaker and round-table participant at several national conventions and seminars. In both 2006 and 2007, Mannie was named to Who’s Who Among America’s Teachers in recognition for his numerous and ongoing educational efforts in the field of strength and conditioning and in bringing awareness to the anabolic drug abuse problem in sports. He has been recognized and is widely published on his adamant stance against performance-enhancing drugs. Dan Riley most recently was the strength and conditioning educator for the Memorial Hermann Sports Medicine Institute. Riley is a retired strength and conditioning coach having spent 27 of those years in the National Football League (19 with the Washington Redskins and eight with the Houston Texans) winning four Super Bowls. Prior to his stint with the Redskins, Riley spent five years as the strength coach at Penn State after serving four years as the strength coach at the United States Military Academy at West Point. Dr. Wayne Westcott has been honored with the Lifetime Achievement Award from the International Association of Fitness Professionals, the Healthy American Fitness Leader Award from the President’s Council on Physical Fitness and Sports, and the Roberts-Gulick Award from the YMCA Association of Professional Directors, the Lifetime Achievement Award from the Governor’s Committee on Physical Fitness and Sports, and the NOVA 7 Exercise Program Award from Fitness Management Magazine. Kim Wood started weight training as a youngster, training to become a better wrestler and football player. He continued his training behind the scenes, as a running back at the University of Wisconsin in the sixties…. long before the fancy weight rooms and training complexes known to today’s players. Later, he worked for Arthur Jones, the legendary designer of the Nautilus machines. In 1975, Kim became one of the first strength coaches of professional football. During that time, he was also one of the three principals who created the now, world famous, Hammer Strength machines. He retired from the Bengals after 28 years with the team and was lucky enough to experience two Super Bowls along the way. For 23 years he was in the collegiate strength and conditioning profession, serving as the Head Coach for Strength and Conditioning at Saint Louis University (2004-2008), the University of Illinois at Chicago (2001-2004), Southeast Missouri State University (1991-2001), and the University of Florida (1988-1990). He got his start in the strength and conditioning field as an Assistant Strength Coach at Florida in 1984 where he was also a weight training instructor for the Department of Physical Education from 1985 to 1988. Tom Kelso is currently an Exercise Physiologist with the St. Louis Metropolitan Police Department. He also trains clients through Pinnacle Personal & Performance Training in Chesterfield, Missouri. Along with my friend and mentor Jim Bryan, the above individuals represent some of the finest minds of the strength and conditioning community. If you are already familiar with some or all of the folks on this list, then count yourself lucky. If you have not explored their work, then I suggest you do so right away.